Harrison Ford, Richard Dreyfuss, and Gary Oldman together in a tech-thriller, sounds like an exciting coming together of three acting legends. But Robert Luketic’s tech-thriller Paranoia is anything but exciting. The film stars Liam Hemsworth as a tech-wiz who hopes to design the next innovative smartphone. While it could have been, and was marketed as, a commentary on our over-dependence on cell phones, it fails to develop any kind of interesting story. Instead Paranoia is just run of the mill corporate espionage fare that only made it to the big screen because of the star power attached. credits narration, he complains that today’s 20somethings don’t have the same opportunities their parents had. In today’s world, jobs don’t provide advancement opportunities or security. It that true or is it just the rant of someone who didn’t achieve the success he thought he would? One of the first things we learn about Hemsworth’s character Adam Cassidy is that his father (Dreyfuss) spent his life working as a laborer. He provided for his family, but never advanced his career. So what was that Adam was saying about the previous generation having all the opportunities? That may be a small point, but it exemplifies the rest of the film. Nothing Adam says or does makes a lot of sense for someone who is supposed to be a hotshot phone developer working for one of the top companies in the world. As soon as he experiences one professional failure he makes two utterly ridiculous decisions that no rational person would make. 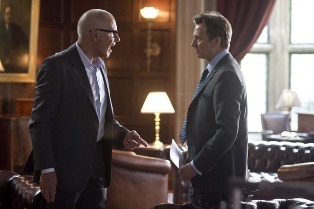 First he blows $16K on the company credit card, and then he readily jumps into the insider trading scheme his boss Wyatt (Oldman) proposes as a way to absolve the credit card bill. Wyatt wants to get the inside scoop from his biggest rival Eikon, which is headed by his former mentor Jock Goddard (Ford). So how do they get Adam in the door at Eikon? They dress him up in a suit and tell him to talk a big game. Otherwise he gets in on his own merits, which made me think that he could have scored that gig all on his own. So now that Adam has infiltrated the rival company, it’s time for the paranoia to start, right? Wrong. 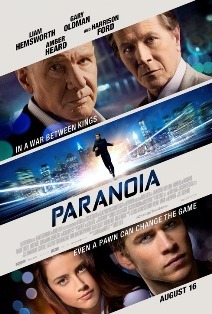 I don’t know why this movie is called Paranoia because it has nothing to do with this story. Okay, for a couple minutes Adam is constantly looking over his shoulder wondering who might be following him, but he has good reason because he’s being watched at all times and he knows it. It’s hard to feel sorry for Adam and his predicament. He is totally to blame. Are we supposed to feel bad he doesn’t really have the fancy car or swanky apartment? He is only 27 years old. Are we really supposed to believe his career is over because one thing didn’t work out? Is any of it enough to believe that someone would succumb to such extreme measures just for a taste of the high life? Yes, he wants to avoid jail, but I highly doubt the penalty for running up the corporate credit card would measure up against the risk of getting caught for corporate espionage. They also throw in the added dimension that Adam’s dad, who is suffering from emphysema, just had his health insurance canceled for no reason and now has $40K in medical bills. So Adam needs money, but he apparently also needs morals. I just didn’t buy that Adam had become so disillusioned with “the system” that he would stoop to criminal activity. Paranoia is a waste of talent. It was cool to see Ford and Oldman chewing the scenery together and Dreyfuss brought a genuine touch of humanity to his role. It’s too bad these guys weren’t given better material to work with. What drew any of them to this script (adapted from the novel by Joseph Finder) is a mystery to me. Aside from the lame story, the other weakest element was Liam Hemsworth. He never brought any intensity to the character, making Adam seem apathetic to the entire situation. Fans of any of these actors would do best to wait for video on this one.